Hello adventurers! It’s been over a month, but we’re proud to announce our biggest and bestest update to The GameBook Authoring Tool yet. You can now manually move your sections about by changing their numbers in the property grid. If a section already has this number, it will swap them over. More exciting than this, you can get GBAT to shuffle the sections for you! There are new shuffle sections buttons in the interface. Pressing this will randomly move the sections about for you. 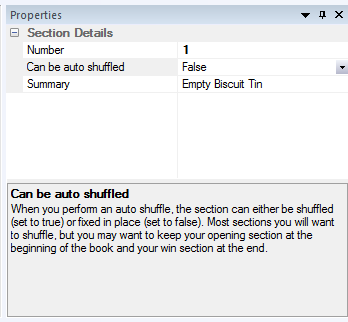 Of course, you might not want to move some sections as they are already in the perfect place. So there is an additional option to fix a section in place. We’re edging slowly into the 1990’s with our user interface. We now have property grids for your section numbering, summarising and shuffling options. This has freed up a lot more space for the section body, where you can spend a lot of time. We’re trying to minimise the amount of time your hands have to leave the keyboard. Press control and F6 to cycle to the next view, and shift and F6 to cycle backwards. We don’t yet have full keyboard control – for example we can only navigate the graph using the mouse. But this is coming. When exporting a book, GBAT will now ask if you want to open this book. Which is nice! We’ve added some more imps. Tiny little features that are super useful, for example, creating a new choice will now suggest the next available section number as the destination. Adding a choice keeps the focus in the choice area. ← GBAT 1.2 is released!